A guide to Amish furniture in TN Tennessee Amish communities include the sizeable settlement at Ethridge, home to numerous Amish woodworkers. Amish furniture can be found in TN Amish enclaves as well as Amish furniture outlets across the Volunteer State, within easy reach of Nashville, Memphis, Knoxville, Chattanooga, Clarksville, Jackson, and other cities in Tennessee. Amish furniture outlet featuring dining rooms, bedrooms, entertainment centers, mattresses, living rooms. Dressers, beds, nightstands, dining tables, chairs, occasional furniture, benches, hutches, entertainment centers, cabinets, TV stands, more, in Queen Anne, Shaker, Mission, and a range of other styles. Within the Nashville area. Nashville -region Amish furniture dealer. Specializing in Amish outdoor furniture and gazebos from PA and Ohio (custom-made; also self-assembly kits). Pergolas by local Mennonite craftsmen. Poly outdoor furniture, wood outdoor furniture in pine and cedar; vinyl outdoor furniture. Picnic tables, gliders, porch swings, rocking chairs, Adirondack chairs, cabanas, children’s playhouses, swingsets, bridges. Located an hour west of Nashville. Nashville -area food and Amish products store with an Amish furniture offering, including chairs, tables and dressers. Two furniture lines: Cedar chests, tables, chairs, outdoor furniture, as well as pine and poplar furniture. Custom-made Amish furniture available; also pieces in walnut, cherry, oak. Memphis-area retailer of Mennonite and Amish-made playsets, pergolas, gazebos (wood, vinyl), pool houses, storage buildings, as well as gliders, benches, rockers and swings. Amish hardwood furniture including pieces for dining rooms, bedrooms, family rooms and entertainment centers, located near Nashville. Associated with Martin Furniture of Murfreesboro. Located near Tennessee’s largest Amish settlement at Ethridge, 1.5 hours’ drive south of Nashville. Wide selection of handcrafted solid hardwood Amish furniture (also Mennonite furniture) in a variety of styles and finishes. Armoires, dressers, nightstands, children’s furniture, chests of drawers, benches, chests, cribs, chifferobes, vanities, mirrors, more. Woods include brown maple, cherry, oak, quartersawn white oak. Located 1-1/4 hour drive east of Knoxville. For Amish furniture outlets outside Tennessee try the Amish Furniture main directory, containing listings of Amish wood craftsmen and Amish furniture dealers across the country. For information on Amish settlements and furniture businesses in and around Nashville, visit the Amish Furniture Nashville guide. Note to Tennessee residents: Please be sure to check opening hours of any Amish furniture businesses listed in this guide before traveling long distances. While we strive to keep this directory up-to-date, business locations and schedules can change. Not responsible for changes to information. Tennessee is home to one of the most sizable Amish populations in the South. The community at Ethridge, lying about a 90-minute journey south of Nashville, is home to approximately 1,500 Amish. The Ethridge Amish are quite conservative, using limited technology and living well down the Plain spectrum in terms of material conveniences and dress. However, limited technical resources have not prevented a woodworking industry to develop in this corner of Tennessee, with numerous Amish furniture shops tucked away on the country lanes snaking across the region outside the 500-person village of Ethridge. Amish cabinet shops, furniture craftsmen, hickory rocker makers, and more can be found among the community’s numerous Amish-operated businesses. Some Amish woodworkers create custom made-to-order furniture in addition to standard pieces. Furniture making is an important entrepreneurial segment, which in tandem with agriculture has allowed this plain Amish community to survive and grow since their founding here in the 1940s. Beyond Ethridge, around a half-dozen other Amish communities can be found in the Volunteer State, including in Carroll County. Most are much smaller than the Ethridge community, consisting of a few dozen households at most. Read more on Tennessee Amish. Amish furniture has attracted buyers across Tennessee and elsewhere thanks to, among other aspects, its reputation for high quality. Amish furniture is typically produced in family-run shops, often located on the home property of an Amish craftsman. With furniture typically produced in small batches, Amish woodworkers have a reputation for attention to detail and quality workmanship. Perusing websites and literature for Amish furniture sellers, frequent mention is made of the use of high-quality solid hardwoods (as opposed to veneer or pressed wood construction). Woods popular with Amish include cherry, walnut, oak, hickory, elm, poplar, maple, quartersawn oak, and more. Amish also construct pieces using softwoods such as pine and cedar. Amish craftsmen are also versatile enough to create furnishings for every room of the home, including the bedroom, kitchen, children’s room, office, dining and living rooms, and bathroom. Amish woodworkers produce custom pieces such as cabinets and islands for kitchens. Styles include Queen Anne, Traditional, Shaker, Contemporary, Prairie, Mission, and more. Amish are also not limited to the interior, producing many kinds of outdoor pieces, including gliders, rockers, gazebos, sheds, poly furniture, lawn ornaments, and more. For these and other reasons Amish-made furniture compares favorably with that made in mass-production-oriented factories and as a result has found a strong following among furniture buyers in Tennessee. 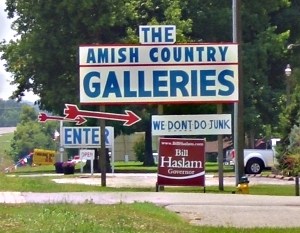 Volunteer State Amish furniture shoppers have a range of choices. As a state with a sizeable Amish population, visiting an Amish furniture craftsman in person is not out of the question. The Ethridge Amish community remains the best choice in terms of number of craftsmen, though other Tennessee Amish settlements remain possibilities. For those wishing to shop for Amish furniture in the comfort of a retail outlet, there are a number of conveniently located Amish furniture dealers across Tennessee, within range of major cities like Memphis, Knoxville and Nashville (with the Nashville area having the highest concentration). Finally, Amish furniture shoppers can of course order Amish woodcraft online, with a number of internet-based Amish furniture sellers working in tandem with Amish woodworkers to sell and deliver home furnishings to addresses across the state of Tennessee. I am interested in becoming a dealer for your furniture and wood structures. Please let me know if you have any dealers close to me. We are expanding into other cities. Check out the business opportunity page on our website and give me a call. We are seeking a dealer in your area. We manufacture white cedar log beds and bedroom groups (chest, dresser, night stand, mirror with white cedar log wrap) We also furnish red cedar same furniture except with cedar from the hills of West Tennessee. We can deliver. Hi. 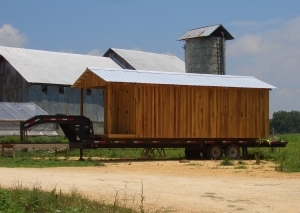 I’m looking to purchase Amish built cabin (cabana style v/s traditional) & I’m also interested in purchasing a cabin like the one in the picture above on the gooseneck trailer. Can you tell me who to call or visit? I live very close to Etheridge, TN. Thank you! I am in search of an Amish crafsman that could supply me with swings, gliders etc. I am in the North Ms areas and can travel to pick up. Amish Excellence in the Factory in Franklin is having a rare floor model sale. Some items are up to 25% off cash and carry. But as always you may custom order from our extensive line of dining room, bedroom and family room furniture. If you haven’t been in our shop recently, we have several new lines now on display. My name is Meilin Curtis. My husband and I bought a farm house in McEwen, Tennessee. we are in a process of remodeling inside. Our friends in Pikeville had Amish or Mennonite people built them very nice cabinets. We appreciated if you would refer my husband and me a few good cabinet makers from your community. My email address is meilincurtis@gmail.com. Thanks! I ran into some nice heavy built outdoor rocking chairs recently. They were initially purchased at a Dickson, TN outdoor furniture store by the name of “Country Meadows”. The store is now out of business. I have been told the rockers were supplied to the store by either Amish or Mennonite builders. Can anyone be of help? The rockers are very heavy, thick wood, and stained to appear as redwood. There is a cup/glass holder in the right arm rest. There are several craftsmen in Ethridge who make outdoor rockers. Chris Gingerich on East Eden; Noah J Giongerich on Dooley Road has a rustic log furniture business; Henry Swartzentruber on Yoder road sells large cedar outdoor furniture, Joseph J Gingerich on Campbellsville Pike and there are others I would guess. If you come down to shop around, stop at the quilt shop at 4111 highway 43 N (On the right if you are coming down from Nashville about 1/2 mile from the man selling outdoor sheds and carports) and they can suggest others or tell you how to get to these. We can supply the red cedar heavy rockers, single or double. Also, large red cedar outdoor swings, large picnic tables with benches, chairs, bars and stools. We deliver. We have the finest furniture available and can meet almost anyone’s budget. Foe example we have queen size beds in solid oak or maple (you choose the stain color, etc)the complete bed for $988. Dining tables beginning at $894 with a lifetime warranty. Hi, I am not sure if this is the right place to start looking, but I am interested in speaking with someone who can make a custom child’s table with chairs. If you know of a way to get in contact with anyone who can potentially do that, please let me know. I am looking for a barrister bookcase to house my father’s stamp collection. Are there any to be had out there? I am looking for an outdoor playset for my grandchildren. Any information will be appreciated. I live in the East TN area. Gish’s Amish Legacies in Murfreesboro, TN carries solid, hardwood, Amish crafted furniture. We have a beautiful formal dining table, chairs & china hutch that is drastically reduced! Visit our website or our shop to see this collection in person! We can also custom order items as well! I live in Jackson Tn and moving to a local location. I have one of the barn style wooden building and need someone to move it to the new location. I had the same building moved two years ago and I think it was Jonathan Toew’s that moved it. Does anyone know of this or any other place that I can get to move this building? Hi! I am looking to buy a wooden playground for my daughter. I live about 15 minutes North of Nashville, about 20 mins south of Franklin, KY. Any suggestions on who to call or where to go look? We have needing a playground by the end of June for her birthday! Please feel free to call me, 615-934-0631. Cedar Log Double Bench And Rockers. I am looking for a pair of mission style night stands. Want to see and not order online. Anywhere close to Chattanooga? We were visiting Knoxville and drove to Greenville, TN to the Amish store listed here. Closed on Monday and looked to be a junk shop judging by what we could see through front windows. Save your time. Charles, sorry you had a fruitless search. Thanks for your alert. My understanding is that Mountain View Furniture moved within the last year to a new address. The phone number and website are still the same. I have a writing desk that needs repair. I am looking for someone to repair it back to what it should be. Hi, we are provide the hire poseure table. Hi, we are provide the hire folding chairs.